After signing up a lot of emails for a preview of its upcoming Flow keyboard, the makers of SwiftKey decided to go public with the beta today, and the APK files for the smartphone and tablet version are up for grabs at the SwiftKey website. SwiftKey is consistently one of the most popular and often the most popular paid app for Android, and for a good reason. Their prediction algorithms are second to none, as the keyboard can learn from your Gmail, Facebook and Twitter accounts content, for instance, and often has eerily good predictions of the whole sentence you are going to type before you finish it, after spending some time examining your feeds. So far, so good, but the biggest things SwiftKey lacks is the finger-tracing input we often associate with Swype, though many other Android keyboards now employ it, and Google even included it in its latest 4.2 default keyboard. 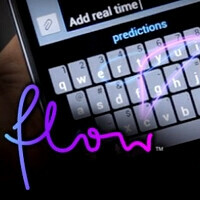 SwiftKey Flow beta is here to remedy this situation, and we gave it a shot, fully aware that this is just a beta software, with a number of kinks to be ironed out still. It is very stable for a beta, though, so you can install it with minimal risk, and go through the usual keyboard setup intro, where you set it as default, choose whether to allow it to link with your Gmail, Facebook and Twitter content, your RSS feeds and your outgoing text messages. This way the keyboard learns how you type, the slang you use, and the abbreviations utilized most, so it gets spooky accurate with time. This we had before, though, so we'd just focus on the finger tracing functionality. First, any lifting off is gone, as you can just swipe through the space bar, and the keyboard will place an interval for you. Coupled with the excellent text prediction algorithms, this makes for unholy sliding speed and accuracy. Moreover, if your phone's screen is not overly huge, you can do it all with one hand easily, firmly gripping the handset between the base of your thumb, and your fat digit while sliding along for whole sentences and even paragraphs. It takes some getting used to, but the more you do it, the more your brain registers the exact space between the keys, and in the end you rarely have to do anything but glimpse down for the keyboard's boundaries. Those of you who are used to the swipe-to-delete feature from other tracing keyboards will find it missing on SwiftKey Flow. You have to long-press the delete key to wipe out the previous word instead, but you can adjust the press duration, so that it doesn't interfere as much with your sliding, though it does break the "flow through space" idea somewhat. Best of all, the goods are delivered in a number of peculiar alphabets, with again the caveat that the language packs are in beta mode, so feedback and comments are appreciated. We found languages other than the major ones somewhat lacking in loaded vocabulary (mainly curse words:) compared to some other solutions like SlideIT, but this will hopefully get better with time. You can, of course, dictate the text with your voice, and customize most aspects of SwiftKey Flow, like adjusting the key height, displaying arrow keys, and dress up the keyboard up in different themes, which you can see in the slideshow below. Usage statistics are gathered to gauge your typing accuracy, and how many taps you've saved with the Flow function - even the mileage of sliding you've done so far is displayed. The verdict - that uncanny prediction accuracy that was typical for SwiftKey translated to its Flow version, letting you just slide over the first two or three letters, and the right word would appear a large percentage of the time, letting you move on to the next word. Since you don't even have to lift your finger off now, entering text is faster than the alternatives as a result, even if you are a good touch typist on your mobile, or utilize Swype, SlideIT, or any of the other great apps out there. Add to this the customization options and the abundance of language packs, which still need some work for the more obscure ones, and SwiftKey Flow is shaping up to be the best on-screen keyboard for Android, in a sea of already excellent keyboards. Swiftkey lags too much on my phone. It takes a few extra seconds to pull up the keyboard when I press the google search bar on my homescreen. Is this any better? And I just bought the original Swiftkey a month ago. Gah. Anyone else not able to download the Language Pack? The US one keep failing and I wonder if it's due to hight traffic on their servers or something. Been trying since I got the email about 4 hours ago. better than google gesture keyboard? Been using the swift key flow since this morning they emailed it at 3am.. I am VERY impressed thus far, I will certainly be purchasing the full version when available. My ONLY gripe is that there isn't an option for a designated number row. Which on the Note is a feature I have come to love. And its hard to live without once you have the convenience! wait..off topic but how come every one is getting downvoted? Anyways, I love swiftkey, its the best! I got it for free from getjar when they where promoting their app store. Because keyboards like this make the fruity fan boys very sad pandas! Haters gonna hate! Plus they have nothing better to do with their time than "thumb down" comments! I got the original Swiftkey for free when Amazon was still doing their daily free apps and it's updated to the each new version and now have the beta installed along side it until it get the official update. just got the beta and works pretty damn good on my S3. I love this keyboard. Never used any other since I have downloaded this one. But, I would stick to old version. I like swipe to delete function and swipe to type is more english speaking countries centric. In our country we chat in our native language making swipe useless most of the time.